Does this need rational explanation? I feel like maybe it should stand alone as a work of surrealist art. 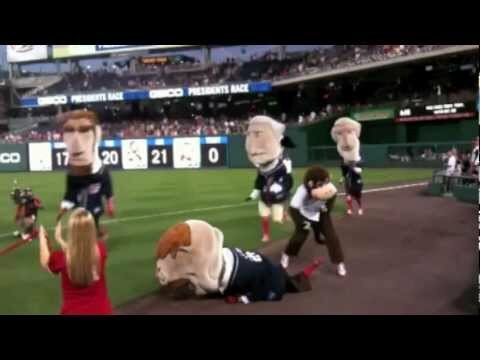 OK, fine: So the Washington Nationals baseball team has a nightly Presidents Race among George (George Washington), Tom (Thomas Jefferson), Abe (Abraham Lincoln) and Teddy (Theodore Roosevelt). The gag is that Teddy never wins and is often thwarted near the finish line in comical ways. According to Let Teddy Win, a “rivalry” had been brewing between the Nats’ presidents and their minor league affiliate Harrisburg Senators’ racing monkeys. So one of them – I’m not clear if this was Bingo, Bongo or Steve – took revenge on Tuesday night by giving Teddy a flying shoulder-block, costing him the win. Teddy Roosevelt, National Wildlife Federation Conservation Hall of Famer, done in by wildlife.